This aluminium shell drum with maple hoops has a great sound, slightly let down visually by the ordinary looking strainer. Boutique construction. Deeper tunings work well. The price and call us shallow, but we're not enamoured with its looks. Gretsch's Gold Series is a recent collection using what the company describes as "high grade materials and boutique-level craftsmanship". For review is a 14"x61⁄2" aluminium shell drum, but others in the series have brass or mahogany ply shells, cherry, maple or oak stave shells, and more. Seamless aluminium shell and maple ply hoops is a new combination on us and certainly qualifies as boutique construction. Brushed aluminium always looks rather lacklustre though and with the basic generic style throw-off we can't say the drum's image grabbed us. Some of the other Gold Series drums in rich veneers look tastier. However, the drum is super light and solidly constructed and has a fine bolt-on round badge in brass over brown pewter in the drop G style. There are 10 double-ended lugs with sunken rods passing through the thick 13-ply Rock Maple satin natural finish hoops. "Rim shots were actually physically painful… we were soon reaching for the earplugs"
Although the strainer looks nothing special it operates rather well. 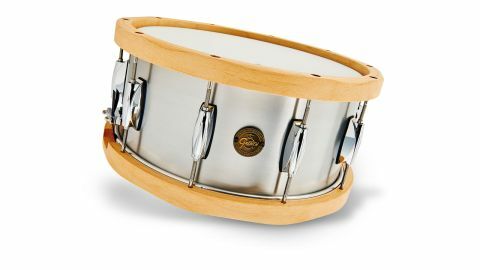 It is smooth and silent and feels sturdy, with the 20-strand steel snares attached by nylon straps and pulled up at 45° to ensure the wires lie flat on the resonant head. Teaming the 1.2mm shell with maple hoops adds up to a pleasing sonic combination. The drum arrived de-tuned and just making a few quarter-turns top and bottom, but staying within relatively deep tuning, there was immediately that dry but warm and dark characteristic aluminium timbre. It loses its distinctiveness a little as you tune up, where the drum sounds brighter but remains focused. Not quite as clangy at the edges as steel, nor as complex in timbre as brass, aluminium has an almost woody tone with a clean, brisk decay. The real surprise though came from the thick maple hoops. Rim shots were actually physically painful. You'd think metal hoops would be more damaging, but these hoops with their rather sharp inner edges were lethal. It may just be the particular piercing tone the combination produces, but whatever, we were soon reaching for the earplugs. Cross-sticks are superb with a pure brittle ping over a woody clack.